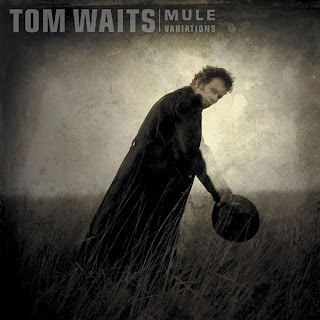 Tom Waits.You may not know this old american singer, you'll never forget his voice, described as sounding like it was soaked in a vat of bourbon, left hanging in the smokehouse for a few months, and then taken outside and run over with a car. Singing since the seventies, he composes all his songs himself, or sometimes with his wife, and he is not afraid to explore some experimental sounds, usually evolving in a sort of gloomy blues, sometimes rock influenced or jazzy. What about this album? It marks the return of Tom Waits after seven years of silence. Apparently, these long years have saddened the old man... As shown in the cover, the mood is not conducive to smiles. This album sweats sadness, darkness, and melancholy. However, even if it sounds sometimes disturbing, uncomfortable, you'll always find a kind of beauty trough the songs...A masterpiece.